Great family fun and some educational experiences can all be had here at Les McDowell's Cowboy Days at the Pioneer Florida Museum. 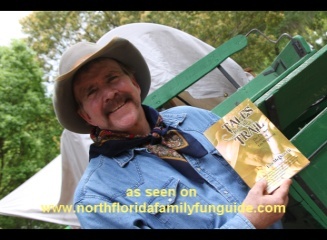 This event is packed with fun cowboy style, FFA petting farm, horse care demonstrations, cracker whip demonstrations, whimsical cowboy comedy show, Cracker cowboy encampment, and a Seminole Indian encampment demonstrating life as it was back in the mid to late 1800's. Great headline talent Matt Stillwell rocked the festival with his cool country sounds. The food looked delicious, with barbeque choices, chicken gyros, sausages and onions and more. Delicious roasted corn was offered for sale as a fundraiser for the FFA. This annual festival is located on the grounds of the Pioneer Florida Museum which is such an educational experience in itself. Many buildings filled with antique artifacts tell stories of how people lived in the 1800's. Amazing train station had so many interesting things to learn. I loved the one room school house which was so well restored it looked like school was in session! It really took me back and made me feel like I was on a movie set! This is a great family friendly adventure with some educational aspects built in!